"I beg to move, That leave be given to bring in a Bill to establish a public register of organisations that carry out lobbying of Parliament for commercial gain; to make provision for disclosure of expenditure by such organisations; and for connected purposes. "...read more. "I have recently met with the chief executive and chair of Health for North-East London (the successor body to the four local PCTs) to make clear to them my opposition to the threats to Leyton Green Clinic, King George's Hospital and Wanstead Hospital. On the Health and Social Care Bill, to radically 'reform' the NHS, many of you have asked me what I am doing about the Bill. I am completely opposed to the changes being proposed and have always made that clear". He had a number of witnesses before the committee and raised many issues including about effects on businesses locally. Please download John Cryer's full speech during Opposition Day on 19th January 2011. 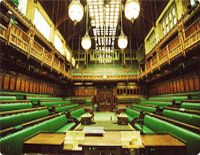 When the House of Commons 'adjourns' every summer, a debate takes place. It is also a day on which Bills are given Royal Assent. Read John Cryer's Maiden Speech in the House of Commons on 10th June 2010.